The most advanced routing system in the world. SAVE $155! A complete routing system featuring the motorized PowerLift Pro® with improved Bluetooth connectivity! 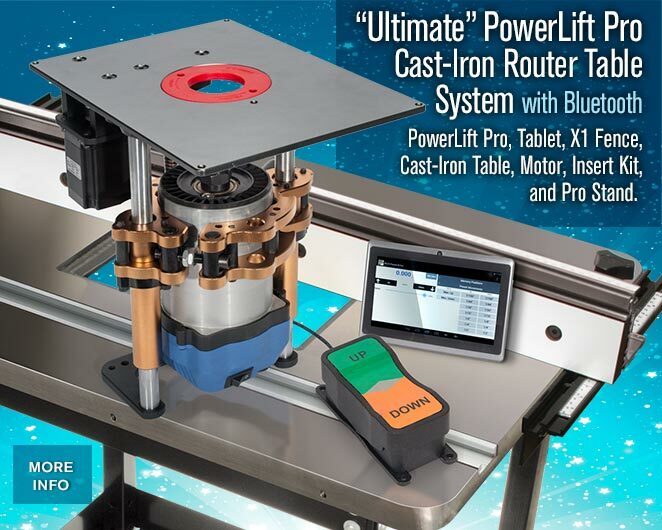 Includes PowerLift Pro with 10" Android Tablet, Cast-Iron Router Table, X1 Fence, 3‑1/4 HP Router Motor, Insert Kit, and Pro Stand. Works mechanically with a foot pedal and/or digitally with the included 10" Android Tablet and app, the heavy duty PowerLift Pro® with Bluetooth handles our 4.2" diameter Router Motor with ease. Makes mortising a breeze. See the PowerLift page for complete PowerLift (#9529) details. Cast-iron top (approx. 24" x 32") with a 3/4" x 3/8" aluminum miter T‑track and mounting provisions for the X1 Fence. Details on Cast-Iron page. This 4" tall fence has a two track mounting system with adjustable rulers. Set the fence to zero and make repetitive movements. See the X1 Fence (#9576) page for complete details. Big 4.2" variable speed (10,000 to 22,000 RPM) 3‑1/4 HP heavy duty router motor handles the biggest router bits. 15 Amp, includes two collet wrenches. Details on the Router Motor (#9564) page. Designed to work with the Phenolic Table, this 35" high by 26" wide by 22" deep stand features square, tubular steel legs with non-slip, adjustable feet. See details on the Pro Stand (#9565) page. SAVE $155! List price $1654.65.